This is the intellectual and control centre of the dwelling. It is a place of quietness and concentration; a place to research and study; a place in which to invent and design, to formulate plans, crystallize ideas and connect with the world. On the right is a plan view is of the dwelling's Work Space. The curved green enclosure to the right, spanning the 90° arc between the two windows, pro­vides a continuous desk surface and storage for books, stationery and equipment. Between each pas­sage and its adjacent window is a floor to ceiling bookcase unit. The curved green unit, spanning the 90° arc between the two passages, is the Laboratory work bench and cupboards. In the centre of the Work Space is a console containing five work stations used for computing, communications and navigation. The Work Space's 7-segment central console is shown on the left. It is rot­ating in order to show details of its 5 equipped segments. Three are comp­uter work stations. One of the remain­ing 2 is a printing and scanning station. Another is a communications and navi­gation station. Each equipped segment has a pair of standard 23" rack rails at the rear, between which up to 3 stan­dard flat-format 23" equipment cabin­ets may be mounted. Two of the 7 seg­ments are unequipped to allow access. 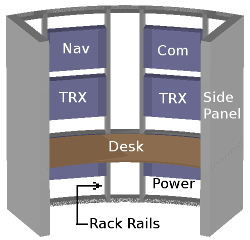 On the right is a plan view of the console, which is oriented to be consistent with the plan view of the whole Work Space module shown above. The two computer segments that are next to each other are straight-forward PC workstations. They have access to the console's local-area network and may be switched off when not in use. 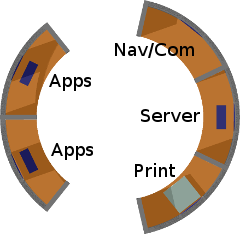 The segment diametrically opposite these two is also a computer station. However, this computer hosts various servers. It is therefore kept running all the time. 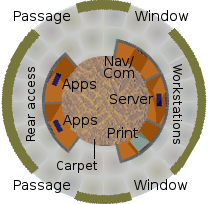 This computer also acts as a router, which provides access for the dwelling to the outside world. The view on the left shows one of the two nor­mal computer stations. 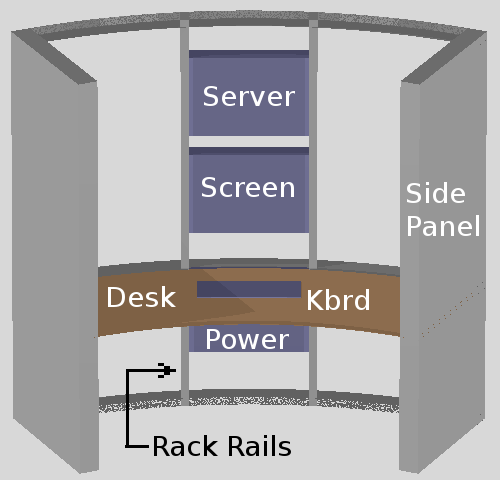 A monitor screen is mounted on the central rack-rails of each sta­tion. The height of each screen can be adjusted independently to suit each human user. Each station's computer is housed in a standard flat-format 23" cabinet set above the screen. The cabinet shown below desk level houses a batt­ery back-up power supply and cooling system for the screen and computer. A keyboard and mouse are placed on the table in front of the screen. A loudspeaker is fixed to each rack-rail just above the screen to provide local sound. Additionally, each computer workstations has a headset (headphones with a boom microphone) for private listening and voice communication. This normally hangs on a hook fixed to the side of the vertical divider panel at the left of the workstation's desk area. Headset cables are normally connected to the left earpiece. Diametrically opposite the above pair of work stations is the server-router station shown on the right. 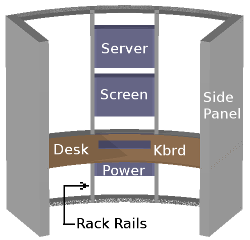 Although it can also be used as a gen­eral purpose PC workstation, the server-router station's main roles are as follows: 1) running on-line servers such as web, FTP, eMule, gnu­tella and G2, 2) running a local area network (LAN) router serving the other two workstations and the printer/scanner station and 3) running an infrastructure router which acts as a 3-way junction in our Landshare World's global net­work. For this reason it is generally kept running continuously. On the right of the server-router station is the printer/scanner station as shown on the left. I can never decide whether I prefer a separate printer and scanner or a device which incorp­orates both. Both options have their different merits. 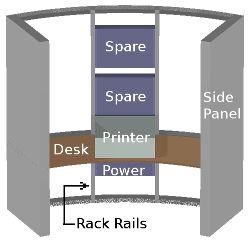 On the left, it is a combined unit that is shown in the middle of the segment's desk space. Its printing and scanning services are made available to the workstations via the local area network. 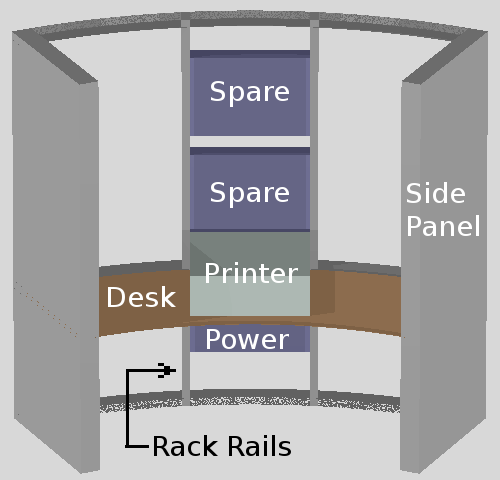 Stationery and consumables for the printer and scanner are stored within the confines of the segment. There is plenty of room around the circular corridor outside the console to access the rear of each flat-format computer cabinet for maintaining and upgrading the equipment. All power and signal cables are channelled neatly within a cable gully along the outer circumference of the desk surface. From there, they run up the insides of the hollow rack rails to the equipment cabinets. The cooling fans in all equipment cases have a unimpeded exhaust path into the large peripheral corridor around the console. The dwelling's means of navigating and of communicating with the world are acco­mmodated within the Nav/Com segment of the console. Uniquely, this segment has two sets of vertical rack rails: one for navigation equipment and one for communic­ations equipment. For this purpose, three radio-frequency (RF) modems are housed in the upper right-hand cabinet of the comms segment. Each of these highly sophisticated and configurable modems is connected by a LAN cable to a router socket on the server-router computer. The co-axial in­put and output of each modem are connected to each of 3 millimetric radio transceivers in the same cabinet. These in turn are connected to dish aerials mounted in the roof of the Work Space module. Each of the 3 millimetric trans­ceivers forms one end of a point-to-point com­munications link between this Landshare dwell­ing and one of 3 neighbouring ones. Thus is formed a worldwide wireless network of low vulnerability. Its much larger number of nodes makes it somewhat slower than the present-day Internet. Not­withstanding, its lack of speed is well overcome by adopting a different paradigm for distributing information. The high bandwidth communication, provided by this Landshare "Internet", is not always necessary. But direct ultra-reliable low bandwidth communication, which the Landshare "Internet" cannot provide, sometimes is, especially in emergencies. For this reason, the communications segment also contains low, medium, high frequ­ency and VHF equipment, which exploit the facilities that nature provides, which do not require an artificial infrastructure. 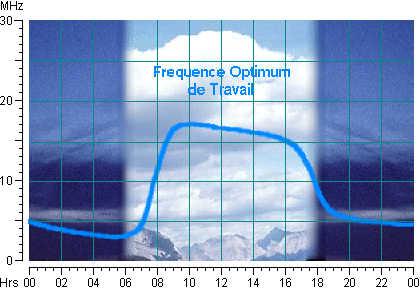 For this purpose, the communications segment also contains radio equipment covering the long wave (low frequency), medium wave (medium frequency), short wave (high frequency) and VHF. Included in the cabinets are front-ends and con­verters reaching up to 2 gigahertz. Rod antennas of various sizes are built into the space above the ceiling of the Work Space module. These extend upwards through the roof above and can be retracted by motors, which also close the roof opening during storms. Magnetic loops of a broad range of sizes are built into the fabric of the dwelling. Dish and array an­tennas are also accommodated in the space above the ceiling of the Work Space module. Landshare society is semi-nomadic. For this reason, the dwelling is vehicular. It is able to move from one location to an­other. For this it needs a means of navig­ation and flight control. 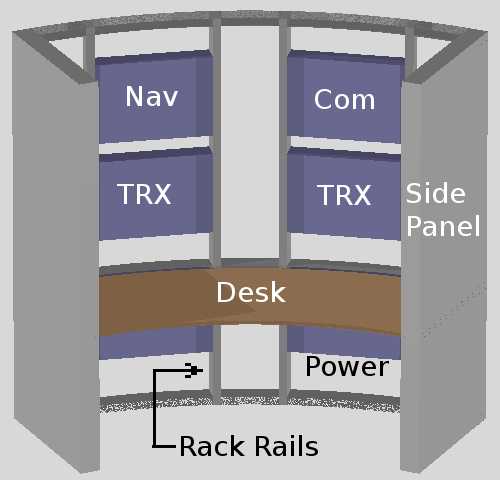 A diversity of act­ive conventional means of navigation are installed in the so far unused tower units in the vertical side cabinets of the central console. These include a compass, sext­ant, inertial platforms, radio aids and GPS. They also include research devices for new experimental means of naviga­tion such as neural network based land­scape recognition, geo-sonic resonance, pulsar signature recognition and autom­atic optical star fixing. The aim of these new experimental methods is to make dwelling navigation as independent as possible of artificial infrastructure. Some of these tower units also contain devices for invoking and controlling the dwelling's motive power. The first type includes monitoring and control units for all the essential systems and services within the dwelling such as electrical power and lighting, heating and cool­ing, air circulation and filtering, vacuum services, water and waste, sound and com­munications, and surveillance. The first type also includes apparatus for monitoring a multiplicity of parameters fed from sensors throughout the gleba. Among these are devices for monitor­ing and analysing natural resources, climate and crop health both in the field and in storage. Software is used for analysing raw data. 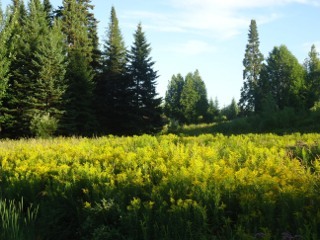 For example, a neural network program is used to an­alyse the spectrum of reflected light from a crop to determine its condition and readiness for harvesting. Other software is used for analysing soil and climate to determine the best crop mixes and rotations for the particular gleba. This gleba-based dwelling is designed to be self-sufficient in maintenance and re­pair. Its occupiers therefore need to be equipped to keep the shell and all its systems in good repair and working order without any help from outside services. This is the purpose of the workshop. The workshop is located in a separate room at ground level beneath the main work space and is accessible only via its own separate outside door. It includes new forms of machine tools made of triangulated tubing of light metal alloys or strong compo­site materials, with mild or tool quality steel being used only for tools and hardened work surfaces. The workshop should be the first space in the dwelling shell to be equipped. The facilities of the workshop could then be fully utilised in the construction of the other spaces and infrastructures of the dwelling.